The Hall is used by such groups as Dancing, Taekwondo, Morton Monkeys, The Bowls Club and, of course, the ever popular Bingo which is held every other Monday and to which everyone is welcome. Childrens’ parties have been on the increase over the past year together with various other functions. We have also had a course on Tai Chi and one on Chair based exercises. The Village Hall is available for Parties, Wedding Receptions, Meetings etc at a cost of £6.00 an hour. Kids’ parties £25.00, which includes heating, use of kitchen, cooker, fridge, dishwasher, urn, crockery, cutlery etc. Please ring the Booking Officer for any information with regard to booking the Hall. 1680 The building was erected for use as a village Malt House where ale was brewed. 1735 The building and adjoining house were bought by the Oldham family. 1752 Morton House was remodelled by John Oldham (stone on the house front). 1834 (Approximately) The Malt House closed down when farmers and cottagers ceased to brew their own Ale owing to the rise of breweries. 1880 The building and house adjoining were sold by the Oldhams to the Storer family of Nethermoor, passing at death to their daughter, Mrs. Goodwin, in the early 1920’s. 1923 The Malt House and Morton House adjoining were purchased by General and Mrs. G. M. Jackson of the Clay Cross Company and then sold to Morton Colliery Miners’ Welfare Committee. The Malt House was subsequently converted into a Hall for village functions with stage and kitchen facilities. The House was adapted as a Miners’ Welfare Club. 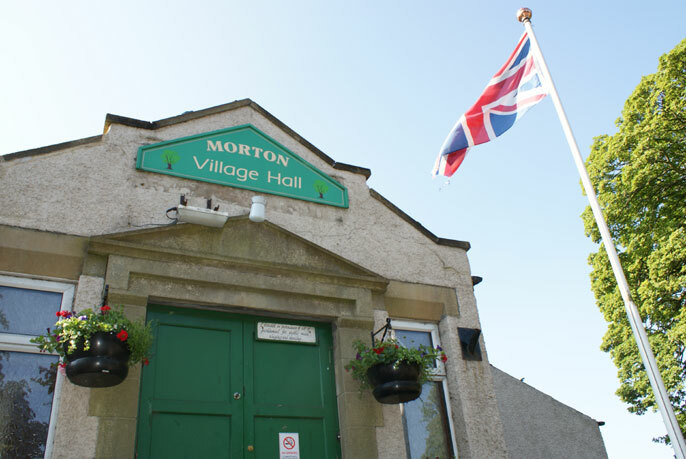 1975 The Hall was purchased by Morton Parish Council and many improvements in facilities and accommodation affected.